If the Section 1 playoffs were held today, the 8-3 Rye High boys? basketball team would be seeded seventh. It?s a respectable record if not an overpowering one. On the plus side, they?ve decisioned larger Class AA schools in non-league encounters, beating Spring Valley, when senior Quinn Kelly went off for 38 points, Ossining (by a margin of 32!) and, most recently, North Rockland. On the minus side, those schools have combined to go 11-20 in the first half of the season. Not the Little Sisters of the Poor, but not the Golden State Warriors, either. 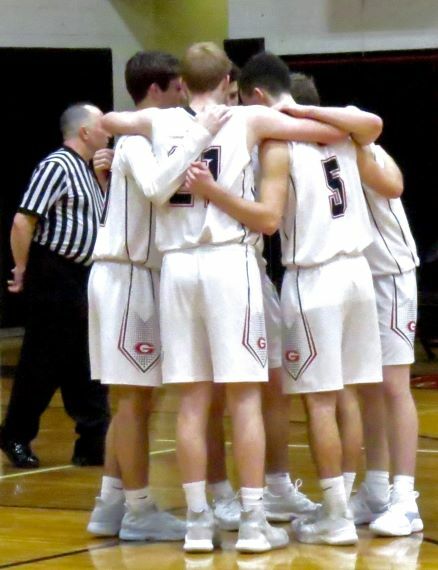 Again on the plus side, Head Coach John Aguilar?s Garnets opened the season with easy wins over Pleasantville and Blind Brook to hoist their own tournament hardware?though at the moment those smaller schools, together, have a record that reads: 10 wins, 12 losses in Class B. Another trophy came the Garnets? way when they capped a day of youth clinics and alumni play last weekend to beat their next-door neighbors, the Harrison Huskies, 53-43, to retain the coveted Michael Ice Memorial Tournament golden ball. On the minus side, Harrison currently sits at the bottom of League 2-D. And Rye?s win over Hen Hud a week before Christmas was nothing to write home about: the 2-9 Sailors are mired in the League 2-E cellar. The record is mixed against the good teams, too. The locals topped 8-2 Horace Greeley 63-61 a month ago in a fast-paced, hard-fought game of basketball in which all their strengths were on display?shifting, stifling defenses and accurate outside shooting, with the occasional drives to the basket by lightning-quick guards Quinn Kelly and Matt Tepedino keeping the Quakers honest. The losses, by 65-50 to undefeated Tappan Zee and 41-33 to perennial champ Byram Hills, were both on the road at the hands of the top-two-ranked Class A teams. But the Garnets? 66-65 loss in another away game?this time to 5-7 Pelham right after the New Year?s break?is inexplicable. Well, maybe not totally. Coach Aguilar explained it by saying, ?We were up a bunch, and then we stopped doing what got us the lead. We started looking for our own individual shots, stopped playing team defense. And their kids made five or six NBA-distance three-pointers. You just have to tip your hat.? Looking ahead, the schedule doesn?t get any easier. If Rye can get past Ardsley in the opener of the Mamaroneck tournament this Friday at 5 p.m., in all likelihood they?ll face the 10-2 Mamaroneck Tigers Saturday at 7. And the hosts would like nothing better than to take back their trophy the Garnets won last year. Then 10-1 league foe Eastchester comes calling Thursday the 24th, followed by Pelham. As for the North Rockland game, Rye looked a little spent just 24 hours after the Byram Hills loss, a game they trailed by only a bucket with 20 seconds to go. Still, Rye trapped and pressed the Red Raiders all over the floor. With Tepedino scoring 12 points in the first half and Kelly 14 points in the second half, the Garnets had more than enough. Their coach, though, was still thinking defense afterwards: ?We?ve allowed 43, 41, and 40 our last three games. I?ll take that. ?